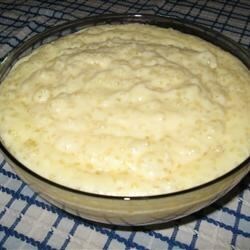 "Classic tapioca pudding is made with very little hassle in a slow cooker. There is no need to presoak small tapioca pearls prior to cooking." Stir together the milk, sugar, tapioca, and eggs in a slow cooker. Cover, and cook on Medium for 3 hours, or on Low for 6 hours, stirring occasionally. Serve warm. Couldn't be easier to make. I added 1/2t pure vanilla and a pinch of salt. Topped with whipped cream and ate it warm...yum!